Custom Custom Rolling Papers for Medical Marijuana - Unbleached Hemp Paper. Great for Medical Marijuana or Cannabis dispensaries. Unbleached, 100% pure hemp paper with natural arabic gum. 1 1/4 size. 32 leaves to a booklet. 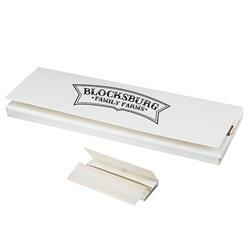 Custom printed with your logo on the rolling paper cover. Typical Imprint Area(s): One color: 2 3/4" x 3/4"
Full color label: 3" x 7/8"
Unbleached, 100% pure hemp paper with natural arabic gum. 1 1/4 size. 32 leaves to a booklet.